It’s an unique product of these lands, unmistakable with its pink color that blends with strokes of light violet notes and organoleptic delicate but strong. It’s easy to match a wine with light dishes, and can be drunk on its own as an aperitif. GOLD MEDAL WINNER IN 2014 FOR BEST FISH WINE FROM IN INTERNATIONAL WINE COMPETITION IN DALIAN (CHINA) WITH OVER 500 WINE PRODUCERS !!! This wine is surely the most typical one among the D.o.c. wines of this area. 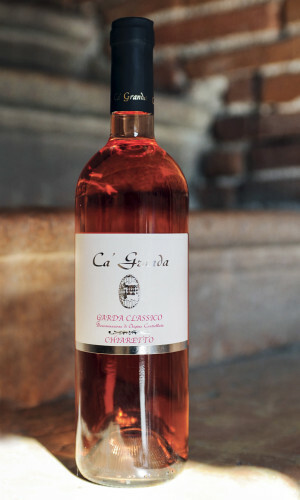 It is obtained from the blended vinification of the Garda red grapes and the brief maceration of their skins in order to obtain an agreeably rosé wine. This wine differs from traditional rosé wines for its floral flavour, with berrieses scents and a slight acidity that gives the wine great freshness and a stunning structure. To appreciate better its typical features, this wine should be drunk while it is still young. It is a wine for the whole meal, excellent with light summer dishes, with fish and white meat, also when they are spiced, with vegetables, broiled meat and Italian starters.